Expedia has grown to become one of the most dominant platforms in travel distribution. Its comparison engine has helped save customers millions of dollars on flights and hotels. At the end of each session, every customer is pushed to buy Expedia Travel Insurance. 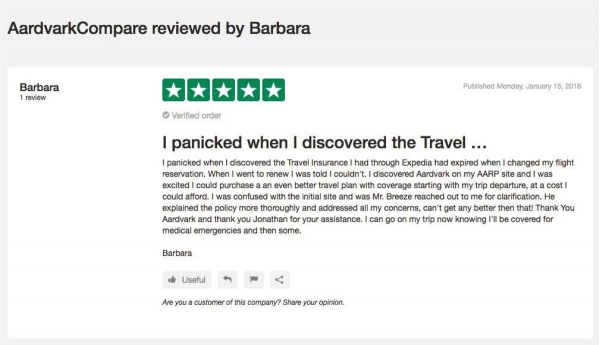 In our Expedia Trip Insurance Review we will show you why we think that Expedia Travel Insurance is the worst type of trip insurance cover we have seen in the United States. We have never seen such expensive trip insurance with so few benefits. Expedia’s Domestic Insurance provides no Travel Delay cover. As in, zero. Expedia does not offer any Baggage cover in its domestic travel insurance. Lost bags are your problem. When traveling internationally, Expedia Flight Insurance offers only pitiful medical cover – $5k. We recommend no less than $100k of medical cover when overseas – Expedia’s Flight Insurance level of protection is totally inadequate. Check the cost and cover from Expedia Travel Insurance. Then run a quote with a Travel Insurance Marketplace like AardvarkCompare. You will get a range of travel insurance quotes from the leading travel insurers in the USA. We worry that customers who buy Expedia Travel Insurance will think that they have useful comprehensive cover, yet be dangerously short of travel protection. It only takes one minute to compare travel insurance. We strongly recommend that Expedia customers do this. But, Is Expedia Travel Insurance Worth Buying? Expedia customers traveling domestically within the USA who think that they are getting cheap Expedia Travel Insurance will have little or no cover. 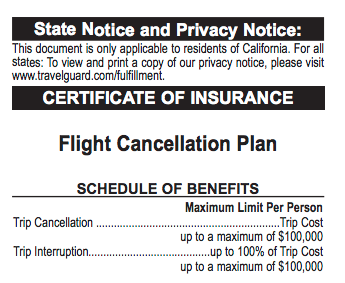 Expedia’s insurer, AIG Travel Guard, won’t even call it Travel Insurance – it is referred to as a ‘Flight Cancellation’ policy. The policy has so little in the way of travel cover we cannot think why the policy was created. It is nearly useless. Should you buy Expedia Travel Insurance when traveling internationally you will have woefully weak protection. Again, AIG Travel Guard will not call it Travel Insurance on its policy documents. This time, it is known as a ‘Flight Total Protection Plan’. There are so many weaknesses in this policy. The international travel health protection is totally inadequate, in our opinion. Please enjoy our comprehensive Expedia Travel Insurance Review. 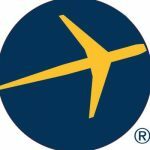 Please do not buy Expedia Travel Insurance until you have read the review. Expedia’s Flight Insurance is provided by AIG, a highly reputable travel insurer. Expedia Travel Insurance is incredibly expensive – twice the price of other policies. Expedia Travel Insurance has very weak levels of cover that are insufficient for most travelers. We cannot recommend that you buy Expedia Travel Insurance. There are a multitude of better trip insurance plans with better cover at a lower price. 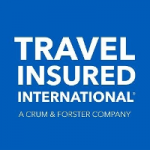 AIG Travel Guard is the underwriting partner for Expedia Travel Insurance. AIG is one of the most respected travel insurance carriers in the USA. Indeed, we are a partner of AIG’s, and host a number of its comprehensive travel insurance policies. However, the policies that AIG provides to Expedia are not Trip Insurance policies. They are described as ‘Flight Protection’ plans, and look nearly worthless to us. Expedia’s International Travel Insurance Plan is called ‘Expedia Total Protection Plan’. Expedia’s Domestic Travel Insurance Plan is called ‘Expedia Flight Cancellation Plan’. We will first cover the Domestic Expedia Trip Insurance, followed by the International Expedia Trip Insurance. 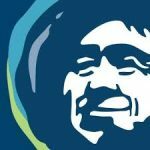 Before we jump into the policies that Expedia offers, it probably makes sense to cover the main reasons that people buy travel insurance in the first place. We want to be able to cancel our trip if we are presented with terrible circumstances at home. If there is a death or serious illness in the family, for example. If we lose our job, we would like to be able to cancel our trip and be compensated. If our vacation is cancelled by our employer, we would like to be compensated for the cancelled vacation. Whether we travel at home or abroad, we want health cover in case we get sick or involved in an accident. If we do get sick or injured, we want our travel insurance to take care of the costs involved in moving us to a medical facility. If our bags are lost by the airline, is there cover in place? Now, there are more options than this in any trip protection policy, but these are the ones that people are most worried about. The ones we consider most critical are the travel health insurance elements, because these have costs that could bankrupt a traveler. Yes, it is annoying to lose a bag, and compensation is nice. But, a $75k medical bill after a serious injury is something that can destroy a person’s financial well-being. Big risks need to be covered, in our opinion. 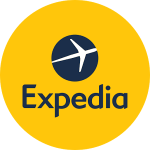 In order to highlight the benefits and protection that Expedia offers on its domestic plans, we ran a full quote. Our traveler is heading from San Francisco to New York, spending a week with friends before heading home. Our flight has a total price of $460. Note that we are encouraged to buy Expedia Travel Insurance – after all, over 40,000 people have bought a policy in the last week. Expedia recommends that we buy flight protection. They highlight the ‘Buy’ area of the screen. Expedia insists that we make a selection to protect our trip, or risk our funds. This cheap Expedia Travel Insurance is only $33. Here is how the language is presented to a traveler. Avoid change fees. Protect your trip. Yes, I want Cancellation Protection for my trip to New York. No, I’m willing to risk my $460.38 trip. Because we are naturally curious, we decided to read more. After all, it sounds as though ‘Mary’ can cancel her trip and get her money back. Well, actually she can only get compensation on this Expedia Travel Protection Plan for a tiny number of reasons. Mary got $468 back when she cancelled her flight to care for her sick husband. As in, this nearly worthless policy has protection for cancellation and interruption only. That’s it. And, of course, the reasons that count as being covered are extreme. It covers disabling injuries or illnesses that make travel impossible, as certified by a doctor. If you are hi-jacked or quarantined or called to jury duty. If you are made redundant. Now, we recognize that these are risks worth protecting, but surely most of us would expect far higher levels of trip insurance cover? We have never seen a trip protection policy with so little useful cover for a traveler. 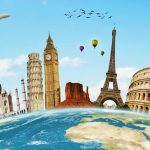 What is Missing from Domestic Expedia Travel Insurance? Most people associate travel insurance with health cover. This is as true for domestic travel as it is for international. Although many of us will have some type of health insurance, there are often restrictions if we travel away from our home state. We should be aware of any additional costs by using out-of-state medical facilities, or out-of-network costs. Every single travel insurance policy that we offer through AardvarkCompare has travel health insurance embedded in. It is standard – every travel insurer seems to offer this on their travel insurance policies. Travelers assume that health cover will be in any policy they buy. We can only assume that most travelers would not even think to check the Expedia Trip Protection policy document. If they did, we assume that they would be shocked by the lack of travel protection. We cannot recommend Expedia Travel Insurance if it does not include this most basic of travel health insurance provisions. In the event that you get seriously injured or very ill, you will need to be moved to the nearest medical facility. The costs of this type of medical transfer can be very high. That’s why we expect to see it in any travel insurance plan. Again, we cannot understand why Expedia does not include it. In the event that our employer cancels our work vacation, it would be great if travel insurance could support us. This type of protection is not available on all policies, but we see it on the more comprehensive plans that we offer. Now, we think that these are pretty important basic trip insurance benefits. We like to see some, if not all of them, on plans that we promote. By far and away, the travel medical insurance and evacuation benefits are most important. These are the ones that offer the most financial protection. The best Expedia Travel Insurance that you could find would have these policy elements included. Expedia does not include them. Its policy is incredibly weak. Look for better options, please. 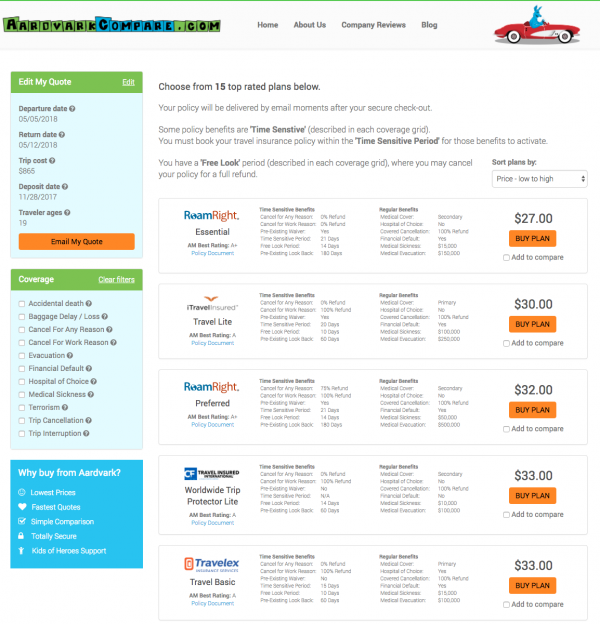 AardvarkCompare is a travel insurance marketplace. We make comparisons of travel insurance policies. 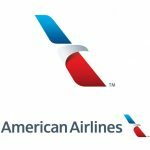 We only work with the USA’s leading travel insurance providers. Our insurers are licensed and regulated in all 50 US states and D.C. Every one of our insurance carriers has many different policy options for our travelers to choose from. Our carriers are happy to have their policies compared against those of their competitors. Every one of our Travel Insurance partners has an A.M. Best rating of at least an ‘A’. Why is this important to an Expedia customer? Expedia will only offer you one option for travel insurance. What they offer you is awful. So, instead of that, we offer you a dozen or so. We do not share your contact information with the insurance carriers. So, our insurance carriers give you binding insurance quotes, but do not then bombard you with marketing. Your quote is anonymous. You receive the best possible insurance rates available. The price of each insurance we share with you is identical to the price if you went to each and every travel insurer directly. So, rather than wasting an hour searching and comparing for our insurers directly, you can do it through us in a minute. 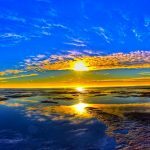 Here is what we found when we went to find travel insurance to compete against the awful Expedia Travel Insurance policy. We quickly found 15 different travel protection options to compare. The cheapest trip insurance was only $19. You will recall that Expedia offered us their awful plan for $33. For this particular trip, we would opt for the iTI Lite Travel Insurance. There really is no comparison between the two plans. The iTI Lite plan is the absolute cheapest travel insurance we can find for this trip. Yet, it is only $19 – just over half the price of Expedia’s policy. Take a look at the differences between these two cheap travel insurance options. There is an embarrassing lack of cover in the Expedia policy. Here are where we think the most obvious cover gaps are. 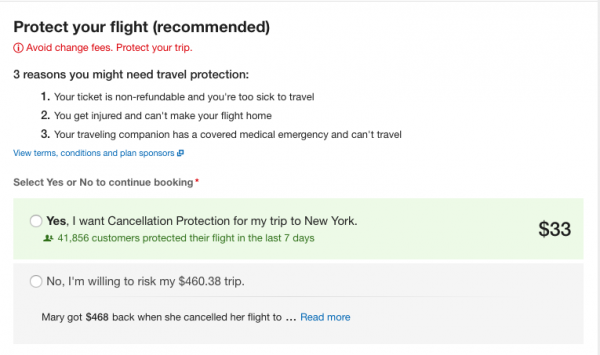 Expedia Insurance – $0. Expedia does not provide travel health insurance. Expedia Insurance – $0. There is no cover from Expedia. We cannot think of any circumstances where we would recommend Expedia Travel Insurance for domestic travel. There are so many better trip insurance options available to buy. We have seen what terrible value it is in terms of like-for-like cover. Now let’s take a look at what we could get for the same price as Expedia is charging. 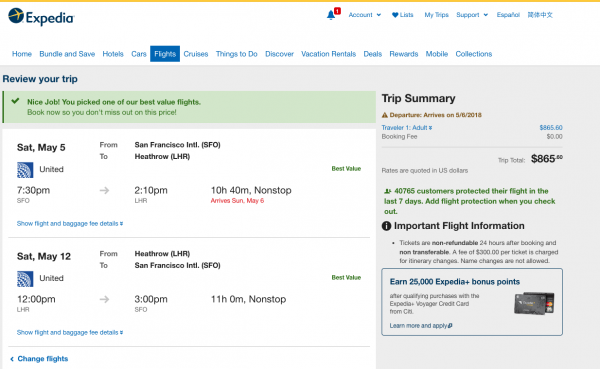 Expedia wants $33 for its Domestic Travel Insurance. Here’s what we can find for $28. In this case, it is the iTI Travel LX. The Domestic Travel Insurance Policy from Expedia is truly awful. There are times when we would like the flexibility to cancel our trip without any reason at all and still receive compensation. This type of cover is known as Cancel for Any Reason Travel Insurance, and is embedded in only the most comprehensive of plans. It is a really useful option for those people who are unsure if their plans will remain consistent, and want the option to cancel, and be compensated. We have long been advocates of the use of this cover to run what we call the Airline Ticket Hack. Essentially, we book a non-refundable airline ticket. Then we add Cancel for Any Reason Travel Insurance. If we need to cancel the flight, we call in the insurance, and get a 75% refund. It’s the smartest way to get low cost, near-refundable tickets that we know of. We love it. Airlines hate it. 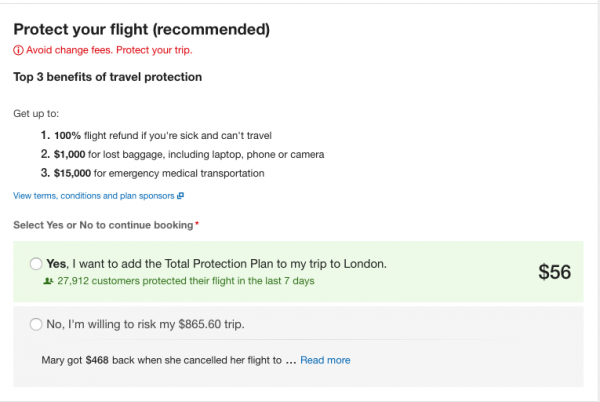 As terrible as Expedia’s Travel Insurance is, its International Protection is actually worse. When traveling domestically, we may have medical cover from home that works for us on the road. If we do not buy domestic travel insurance we will have co-pays and out-of-pocket expenses, but hopefully this will only be thousands of dollars. Now think about traveling internationally. A serious accident or illness can take us into hospital. International state-sponsored public health programs are not going to be available to us. We will need to pay the full cost of any medical treatment we receive. Our recommendation is to have at least $100k of medical cover when traveling internationally. With day rates at international private hospitals hitting $3k to $4k per day, any less seems to create too much financial risk. When overseas, medical evacuation can be critically important as well. Here, we like to see $100k of cover if on a trip close to the USA, and $250k of cover if much further away. 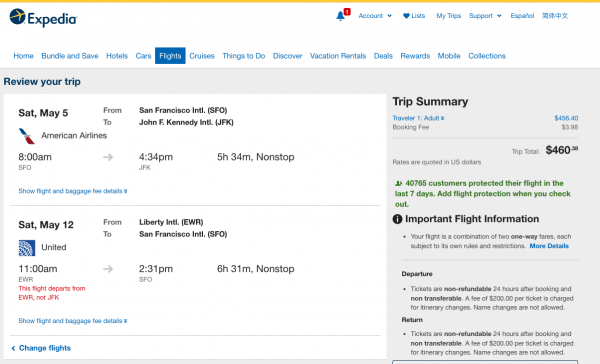 We ran a quote for a flight from San Francisco to London, finding a trip that cost $865. Again, at check-out Expedia encourages us to buy its flight insurance. We get slightly different language from them this time, because the trip insurance policy has changed. Now, that sounds comprehensive, doesn’t it? Anything that is called a ‘Total Protection Plan’ ought to be all-encompassing, you would think. Taking a look, we see the following. The same message that 2 million people buy Expedia Travel Insurance each year. An overview of the benefits that ‘total protection’ buys us for $56. Then we see a similar type of language to scare/nudge our traveler into buying this awful cover. Yes, I want to add the Total Protection Plan to my trip to London. No, I’m willing to risk my $865.60 trip. 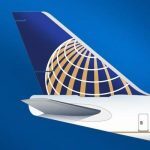 Now, there are a few more benefits on this Expedia ‘total protection’ policy than we saw for the domestic trip. But did you check the cover levels? These cover levels are pathetic as stand-alone insurance levels. They are woefully inadequate unless you have a strong secondary insurance policy that can pick up the vast majority of the costs. These benefit levels are totally insufficient for most international travelers. Once again we run the trip through our travel insurance marketplace. Again, we quickly get more than a dozen different travel insurance options for a traveler to choose from. Please note the massive price differences to begin with. 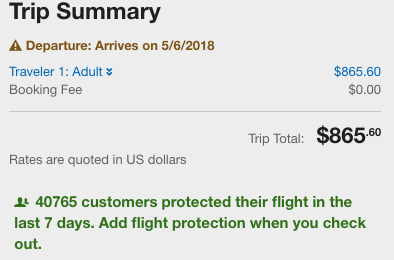 Expedia’s Total Protection Travel Insurance is charged at $56, and has just about enough cover for an international ER visit. Take a look at the trip insurance plans we can find in less than a minute. The cheapest alternative to Expedia Trip Insurance is only $27. Again, we would opt to take the iTI Lite Trip Insurance. For our trip to London, the iTI Lite plan came in at $30, versus the $56 policy from Expedia. Please note the significant difference in cover between the plans, even though the iTI cover is just over half the price of Expedia’s. Expedia Insurance – $5k. Expedia has incredibly weak protection. Expedia Insurance – $15k. Woefully limited cover from Expedia. Travelers should always consider their options when searching for travel insurance. We consistently see International Expedia Travel Insurance as one of the most expensive in the USA with some of the worst cover. There will almost certainly be a better option with more cover and a lower price. AardvarkCompare is a travel insurance marketplace. We get binding insurance quotes, anonymously, from all of our major travel insurance carriers. We provide simple comparison for travel insurance in less than a minute. In the USA, insurance is regulated with anti-discrimination protection in place. Identical travel insurance policies must be sold at the same price. We cannot mark up a policy. We cannot discount a policy. What does this mean to me as a travel insurance customer? If you went to each of our travel insurance partners and ran quotes with every one of them, you would see the exact same price as we quote. We do not charge a cent more. All that we do is compare insurance plans within the market. You no longer need to jump from insurer to insurer. You will see the best rates for each trip insurance policy. All we need is one minute of your time. 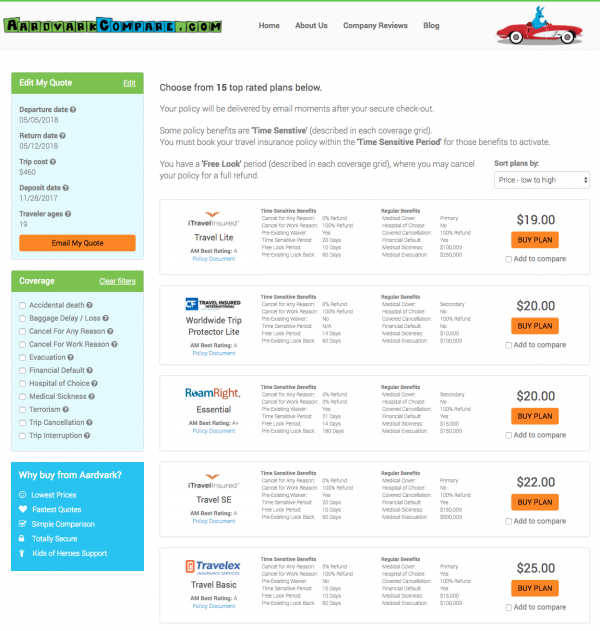 AardvarkCompare is the leading travel insurance marketplace in the USA.